So you got a new shiny phone that supports inductive charging but probably haven't purchased the charger just yet? Take a look at the Incipio Ghost , the Ghost is capable of wirelessly (through inductive Qi or PMA technology) charging your device while on the go. 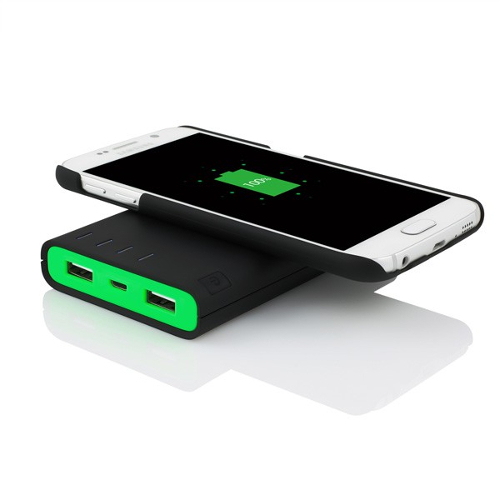 You can recharge the internal battery backup with the included micro USB however the Ghost can also be charged wirelessly if you wanted to purchase the Wireless Qi charging base (sold separately). With this matt, you could place the charger on top of the matt, and your phone on top of the charger to charge them both simultaneously. Pretty crazy... Note that there are a few wireless base models to choose from. The device features dual output USB ports which allow you to easily charge two devices simultaneously with a total offering of 3.1 A (2.1A + 1A) max output for all your devices. The Ghost has a 4000 mAh capacity so it holds a pretty good amount of backup energy. Get your very own Incipio Ghost Wireless Inductive Portable Battery Pack on Amazon . This little charger is great. I love not having to carry around cables when I take it with me.